Lingonberry extract helps normalize blood glucose in HFD-fed DIO mice without significantly affecting food intake or body weight. Lingonberry (Vaccinium vitis-idaea L.) Exhibits Antidiabetic Activities in a Mouse Model of Diet-Induced Obesity. Vaccinium vitis-idaea, commonly known as lingonberry, has been identified among species used by the Cree of Eeyou Istchee of northern Quebec to treat symptoms of diabetes. 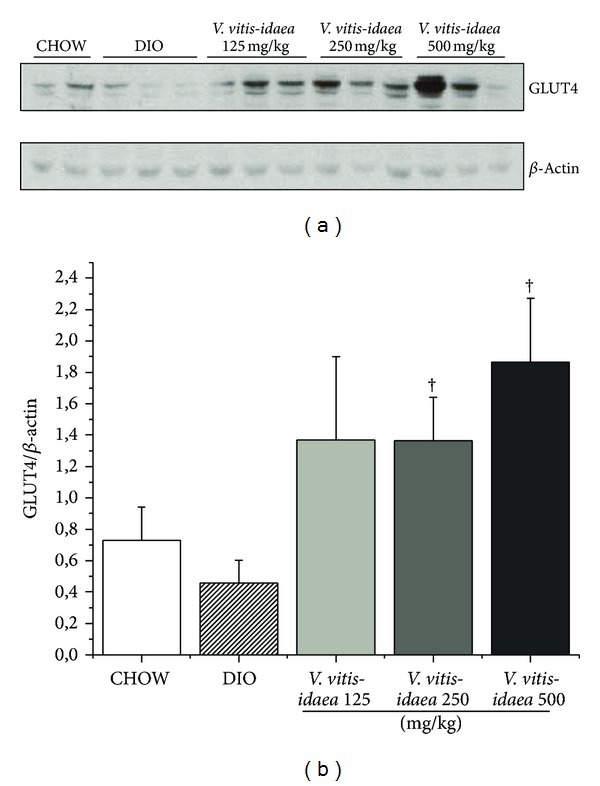 In a previous study, the ethanol extract of berries of V. vitis-idaea enhanced glucose uptake in C2C12 muscle cells via stimulation of AMP-activated protein kinase (AMPK) pathway. The purpose of this study was to examine the effect of plant extract in a dietary mouse model of mild type 2 diabetes. C57BL/6 mice fed a high-fat diet (HFD,∼35% lipids) for 8 weeks that become obese and insulin-resistant (diet-induced obesity, DIO) were used. Treatment began by adding V. vitis-idaea extract to HFD at 3 different concentrations (125, 250, and 500 mg/Kg) for a subsequent period of 8 weeks (total HFD, 16 weeks). 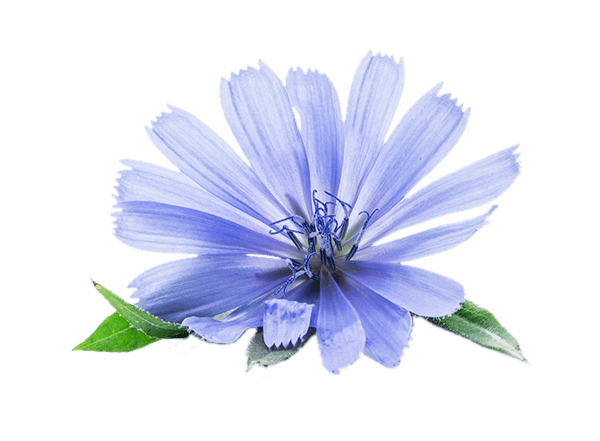 The plant extract significantly decreased glycemia and strongly tended to decrease insulin levels in this model. This was correlated with a significant increase in GLUT4 content and activation of the AMPK and Akt pathways in skeletal muscle. V. vitis-idaea treatment also improved hepatic steatosis by decreasing hepatic triglyceride levels and significantly activated liver AMPK and Akt pathways. The results of the present study confirm that V. vitis-idaea represents a culturally relevant treatment option for Cree diabetics and pave the way to clinical studies. 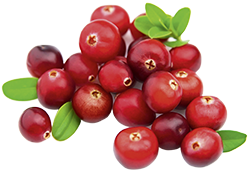 Bilberry and lingonberry containing anthocyanidins, procyanidin, and resveratrol exert protective effects against blue LED light-induced retinal photoreceptor cell damage. BACKGROUND: Blue light is a high-energy or short-wavelength visible light, which induces retinal diseases such as age-related macular degeneration and retinitis pigmentosa. Bilberry (Vaccinium myrtillus L.) and lingonberry (Vaccinium vitis-idaea) contain high amounts of polyphenols (anthocyanins, resveratrol, and proanthocyanidins) and thus confer health benefits. This study aimed to determine the protective effects and mechanism of action of bilberry extract (B-ext) and lingonberry extract (L-ext) and their active components against blue light-emitting diode (LED) light-induced retinal photoreceptor cell damage. METHODS: Cultured murine photoreceptor (661 W) cells were exposed to blue LED light following treatment with B-ext, L-ext, or their constituents (cyanidin, delphinidin, malvidin, trans-resveratrol, and procyanidin B2). 661 W cell viability was assessed using a tetrazolium salt (WST-8) assay and Hoechst 33342 nuclear staining, and intracellular reactive oxygen species (ROS) production was determined using CM-H2DCFDA after blue LED light exposure. Activation of p38 mitogen-activated protein kinase (p38 MAPK), nuclear factor-kappa B (NF-κB), and LC3, an ubiquitin-like protein that is necessary for the formation of autophagosomes, wereanalyzed using Western blotting. Caspase-3/7 activation caused by blue LED light exposure in 661 W cells was determined using a caspase-3/7 assay kit. RESULTS: B-ext, L-ext, NAC, and their active components improved the viability of 661 W cells and inhibited the generation of intracellular ROS induced by blue LED light irradiation. Furthermore, B-ext and L-ext inhibited the activation of p38 MAPK and NF-κB induced by blue LED light exposure. Finally, B-ext, L-ext, and NAC inhibited caspase-3/7 activation and autophagy. CONCLUSIONS: These findings suggest that B-ext and L-ext containing high amounts of polyphenols exert protective effects against blue LED light-induced retinal photoreceptor cell damage mainly through inhibition of ROS production and activation of pro-apoptotic proteins. 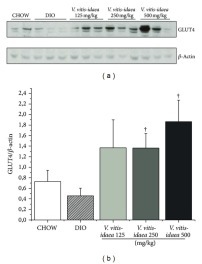 Anthocyanin fractions of wild berries strongly inhibit the replication of influenza virus A/H3N2 and coxsackievirus B1 in vitro. In vitro antiviral activity of a series of wild berry fruit extracts against representatives of Picorna-, Orthomyxo- and Paramyxoviridae. Wild berry species are known to exhibit a wide range of pharmacological activities. They have long been traditionally applied for their antiseptic, antimicrobial, cardioprotective and antioxidant properties. The aim of the present study is to reveal the potential for selective antiviral activity of total methanol extracts, as well as that of the anthocyanins and the non-anthocyanins from the following wild berries picked in Bulgaria: strawberry (Fragaria vesca L.) and raspberry (Rubus idaeus L.) of the Rosaceae plant family, and bilberry (Vaccinium myrtillis L.) and lingonberry (Vaccinium vitis-idaea L) of the Ericaceae. The antiviral effect has been tested against viruses that are important human pathogens and for which chemotherapy and/or chemoprophylaxis is indicated, namely poliovirus type 1 (PV-1) and coxsackievirus B1 (CV-B1) from the Picornaviridae virus family, human respiratory syncytial virus A2 (HRSV-A2) from the Paramyxoviridae and influenza virus A/H3N2 of Orthomyxoviridae. Wild berry fruits are freeze-dried and ground, then total methanol extracts are prepared. Further the extracts are fractioned by solid phase extraction and the non-anthocyanin and anthocyanin fractions are eluted. The in vitro antiviral effect is examined by the virus cytopathic effect (CPE) inhibition test. The results reveal that the total extracts of all tested berry fruits inhibit the replication of CV-B1 and influenza A virus. CV-B1 is inhibited to the highest degree by both bilberry and strawberry, as well as by lingonberry total extracts, and influenza A by bilberry and strawberry extracts. Anthocyanin fractions of all wild berries strongly inhibit the replication of influenza virus A/H3N2. Given the obtained results it is concluded that wild berry species are a valuable resource of antiviral substances and the present study should serve as a basis for further detailed research on the matter. There are 367 on Vaccinium vitis-idaea. There are 495 on Lingonberry. 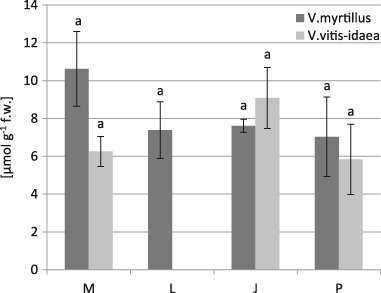 Genetic variation associated with healthy traits and environmental conditions in Vaccinium vitis-idaea. Workflow followed in this study from sample collection to functional annotation of putative SNPs for Vaccinium vitis-idaea subsp. minus Zobayer Alam, et al. BMC Genomics. 2018;19:4. Genetic variation associated with healthy traits and environmental conditions in Vaccinium vitis-idaea. 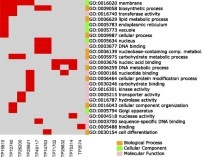 Distribution of gene ontology annotations for Vaccinium vitis-idaea subsp. minus genomic sequences obtained by BLAST2GO. 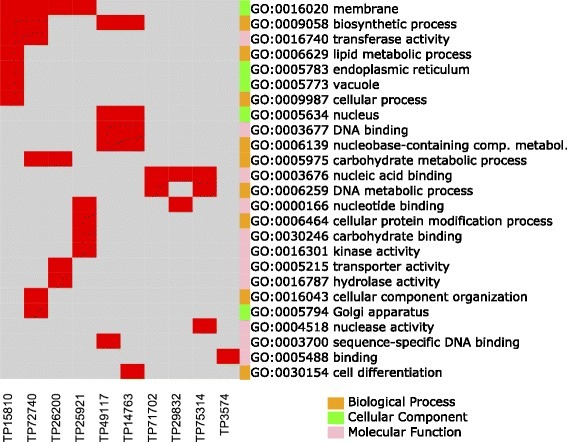 Red bars indicate that a particular SNP-containing gene is annotated with the given GO term. The color bars to the left of the GO term identifiers indicate the category to which that particular GO term belongs Zobayer Alam, et al. BMC Genomics. 2018;19:4. Bioaccumulation of heavy metals and ecophysiological responses to heavy metal stress in selected populations of Vaccinium myrtillus L. and Vaccinium vitis-idaea L. Proline contents (µmol g−1 fresh weight) in V. myrtillus and V. vitis-idaea leaves (mean values ± SE, n = 9). Different letters above the columns indicate significant differences for the species (p < 0.05) Marta Kandziora-Ciupa, et al. Ecotoxicology. 2017;26(7):966-980. 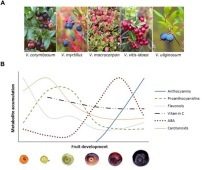 On the Developmental and Environmental Regulation of Secondary Metabolism in Vaccinium spp. Berries. (A) Vaccinium berries: highbush blueberry (V. corymbosum), bilberry (V. myrtillus), cranberry (V. macrocarpon), lingonberry (V. vitis-idaea), and bog bilberry (V. uliginosum). (B) Schematic representation of the accumulation of key metabolites during bilberry fruit development and ripening. The highest mean values of different compounds are 3960 μg g-1 FW for anthocyanins, 216 μg g-1 FW for proanthocyanidins, 130 μg g-1 FW for flavonols, 82.5 μg g-1 FW for vitamin C, 6.2 μg g-1 FW for ABA and 81.8 μg g-1 DW (14.4 μg g-1 FW) for carotenoids, according to , , and , ). Katja Karppinen, et al. Front Plant Sci. 2016;7:655.